Here are the top 3 best paintball shoes or cleats in 2019. 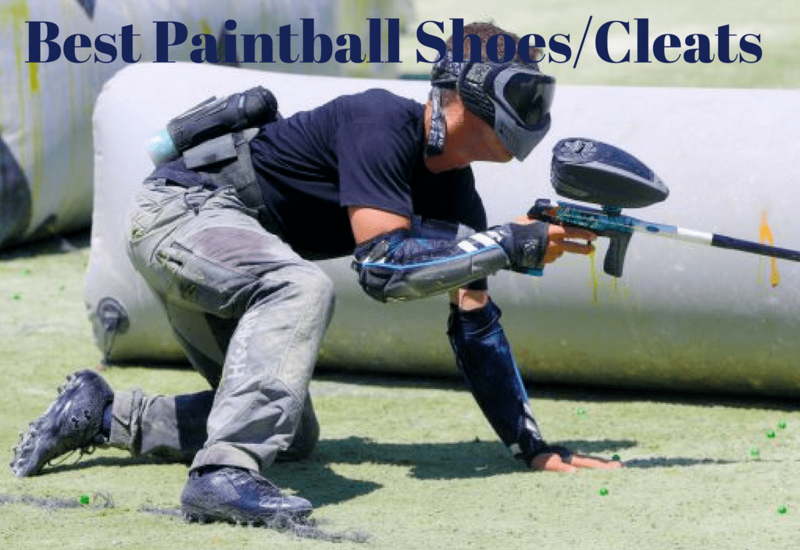 These 3 paintball shoes that are specially designed by some of the most reputable paintball brands can really improve your game. We’ve got the HK shredders on the list which has been pretty much designed for paintball or built from the ground up as a paintball shoe. It’s a great shoe with great features. They’re lightweight, comfortable, extremely breathable and most importantly they’re durable which for a lot of shoes they just fall apart when you start wearing and beating them up. Also, they’re not that expensive. So HK Shredder Paintball Cleats comes in a bunch of different colors from green, red yellow to just standard straight colors like red blue and black. They come in different sizes according to the customer’s choice. It’s made out of a leather construction so the quality of the leather is great. stitching through the leather and the leather quality is fantastic. So, you’re not gonna have a shoe that just falls apart on you. Plus the leather is integrated with mesh breathable materials so not only you’re getting the structure and strength of the leather but you’re getting the air pass through or the breathability of the mesh construction. So on those hot sweaty days, you’re not gonna have a shoe that just stinks because your foots been in it all day long. With this air movement that’s gonna go through your shoe, your feet should stay relatively dry and super comfortable. The back of the shoe does have an air pocket in the heel so you have an air cushioned or air pocket cushion heel. When you’re running and the heels striking the ground or you’re diving sliding jumping whatever this air pocket would give extra comfort to your heel. Also, the grip pattern on the bottom is great. The spiking on the bottom is not overdone. You don’t feel the cleat underneath there. It’s even more comfortable because don’t feel like something’s pushing up through the bottom of the shoe into your foot where big spikes sometimes do. Next, on the list are Exalt Paintball Shoes. Exalt TRX Paintball Cleats are designed specifically for the sport of paintball. 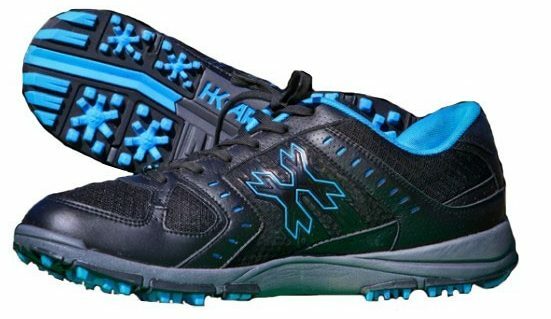 They’re not a crossover shoe like something that people would wear for football or baseball and then you’re gonna wear it in paintball as well but exalt designed these as a paintball shoe intended for the sport of paintball. The shoe itself has a synthetic leather outside with the mesh so good venting on there. The padding around the heel is nice and thick so it’s gonna be comfortable and snug against your heel. You’re not gonna feel your heel sliding up or popping out of this shoe because the way that it’s kind of formed your heel locks into the back of it and it’s gonna hold it in place. They’ve got ribbing along the side to provide extra grip when you are crawling on the ground. Interestingly you could technically wear this shoe without any of the cleat parts that go onto it and you still get pretty good traction on turf or grass. If you’re gonna be playing in anything that’s starting to get slippery or wet you can add the cleat parts to the bottom of it. Comes with a nice thick padded tongue to get great comfort. The insole is removable so if you have insoles that you want to put in there gel insoles or specific ones for your feet you can definitely remove the insole. Another nice thing about the tongue is that it is actually attached with some elastic so you’re not gonna get a lot of the tongues sliding back and forth. It’ll help you to hold the shoe on your foot perfectly. 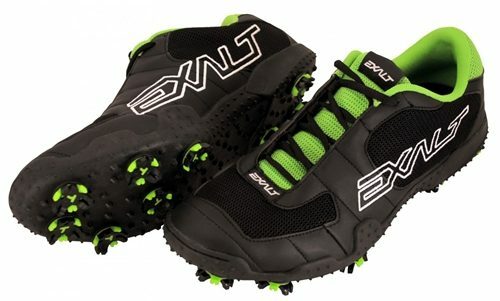 Exalt TRX Paintball shoes are best known for its flexibility. It’s a lightweight shoe with good flexibility so it’s not gonna feel like a stiff hard bottom cleat like some football cleats but these Exalt shoes will give you good flex and comfort. As far as the bottom is concerned again you can wear them with or without the cleats. Now you get two sets of spikes with it. One of them is really really wide and it’s gonna give you good overall grip for short turf kind of things like grass cut grass turf or really loose dirt or compacted dirt. If you’re looking for something that’s got a little bit more bite to it like a football field where you might have uneven ground then you might want to look at the bigger cleat. I typically wear the golf spike on there because playing on turf these spikes are gonna be perfect. Overall, these are great paintball shoes. I definitely recommend checking these shoes out. These come in all sorts of sizes. you’re always going to see it in the black and green though that’s the only the color they’re available in but check for size availability. ends up on rocky terrain, grass, dirt or muddy. 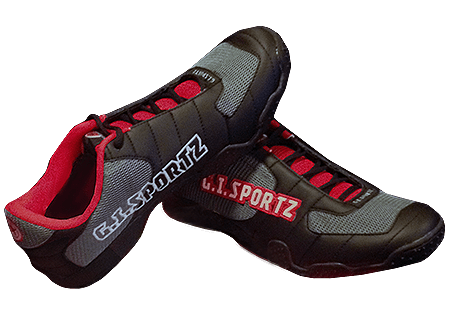 GI Sportz Faster’R Paintball Cleats are lace-up cleats and they have great padding all the way around so plenty of comfort in there. These shoes come with the nice thick sole on the bottom so it doesn’t feel like you’re standing on spikes. I’ve worn cleats before where you can feel the cleat in the bottom of your soul like pushing up against you. You don’t feel with these shoes so great support in the bottom. The tongue is nice and thick and it has these support on the side so your tongue won’t roll over. The well-padded tongue protects the top of your foot from the laces. All the gray area that you see in the picture is great mesh transfer so it’ll keep the air flowing and keep your feet from getting too sweaty. Now flexibility wise GI Sportz Faster’R Paintball Cleats are super bendable. You can twist them around so there’s a great movement in these shoes. We paintballers, spend a lot of time crawling or kneeling where our shoes are bent over because we’re in some awful position hiding behind the smallest bunker possible. You want your shoes to be able to move with you and you want them to be comfortable so a shoe that can twist in both directions and that can bend. Well, for that purpose GI Sportz Faster’R Paintball Cleats are super flexible. The bottoms have really 3 different kinds of spike options. First one is static that you can’t change. You’ll find little nubs all over the bottom surface which provides the first level grip to the shoes. You got golf style spikes which are designed for astroturf or synthetic grasses to give as much grip as possible because those things can get pretty slippery sometimes so this is going to help with that. Second typical cleat style is for grasses or natural terrain. These work perfectly fine on uneven terrains. So this is the kind of cleat you want for a real environment grasses, dirt rocks or mud. Well, these were the top 3 best paintball cleats or shoes for paintball. These paintball cleats give you more traction so that you can move with more agility. Added agility with these paintball shoes would definitely enhance your game. I hope with the help of the detailed review you’ll be able to choose the best one for you among these 3 paintball cleats. I hope you enjoyed reading this article on the best paintball cleats in 2019. If you have any questions regarding any of these shoes or any suggestions feel free to comment down in the comment section.